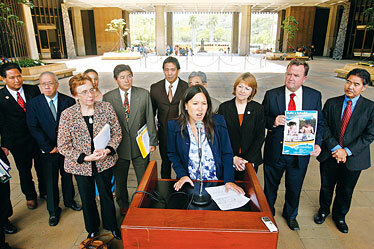 State Rep. Maile Shimabukuro spoke during a press conference yesterday at the State Capitol announcing a bill proposing a temporary Keiki Health Care Insurance program for the roughly 800 children of former Aloha Airlines employees. The children of more than 2,000 Aloha Airlines workers laid off after the airline shut down on March 31 could be eligible for a new medical insurance program being proposed by state lawmakers. The proposed legislation to provide temporary health insurance through Dec. 31 for children of Aloha employees is intended as a stopgap while their parents look for new jobs, lawmakers said yesterday. Lawmakers estimate between 800 and 900 children would be eligible. "It's real limited -- just to try to get them through a crunch time," said Sen. Rosalyn Baker (D-Maui), a member on the Senate Committee on Health. The latest draft of Senate Bill 69 would provide basic medical and dental coverage for children 31 days to 18 years old. If approved, the program is expected to take effect in mid-May. The measure specifies "children of workers employed on March 29, 2008, by a Hawaii interisland air carrier that was in bankruptcy proceedings on that date." The bill, which would modify a three-year Keiki Care pilot project that began April 1, waives a requirement that a child be uninsured for six continuous months in the case of laid-off Aloha employees. It also has no income or asset limits. "Of course we realize Aloha aren't the only employees out there suffering, but they were the largest mass layoff in the history of our state," said Rep. Maile Shimabukuro, (D-Waianae, Makaha, Makua). Costs of the proposed program would be split between the Hawaii Medical Service Association Foundation and the state Department of Human Services, which estimates its cost would be $23,000 a month. While all laid-off workers may obtain temporary continuation of health coverage at group rates under federal law, they must pay the full cost of those premiums, including the portion that their former employer had been paying. The bill is scheduled to be heard today by the House Finance Committee. If approved, the measure would need to be voted on by the full House before moving on to Gov. Linda Lingle for final approval.